GoDaddy not only a domain registrar but also they provide email and web hosting features. 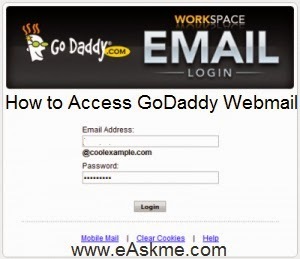 You can easily access GoDaddy webmail email from GoDaddy and also from other email clients where you configure it. How to Access GoDaddy Webmail ? How to Access Email through GoDaddy ? Click on "Manage Account" besides email address. Click on envelop icon under "Actions" and your emails will open. Click on the email you want to read. How to Access GoDaddy Webmail Email Through Other Email Clients ? Open your email client and enter your GoDaddy email address and password there. Setup outgoing and incoming email servers. If you have secure connection enable then add port no "143" into incoming port if using IMAP, or "110" into incoming port if using POP and if you have secure connection enable then for IMAP port no is "993" and for POP port no is "995". For outgoing port if you have secure connection then use port no "465" or if you do not have secure connection enable then use "25," "80," "787" or "3535". Enter Password of your outgoing mail then click finish.